The following is the full Viet Nam-India Joint Statement issued on the occasion of State President Tran Dai Quang's State visit to India from March 2-4 at the invitation of Indian President Ram Nath Kovind. 1. At the invitation of H. E. Shri Ram Nath Kovind, President of the Republic of India, H.E. Mr. Tran Dai Quang, President of the Socialist Republic of Viet Nam, and Spouse paid a State Visit to the Republic of India from 02-04 March 2018. The President of Viet Nam was accompanied by a high-level official delegation, including Deputy Prime Minister and Foreign Minister H.E. Mr. Pham Binh Minh, leaders of many ministries, provinces and a large business delegation. 2. During the visit, the President of Viet Nam Tran Dai Quang was received by the President of India and accorded the ceremonial Guard of Honour at the Rashtrapati Bhavan; paid floral tributes at the memorial of Mahatma Gandhi at Raj Ghat; held talks with and attended the State Banquet hosted by the President of India; held delegation-level talks with the Prime Minister of India, Shri Narenda Modi. President Tran Dai Quang received Hon’ble Speaker of Lok Sabha Smt. Sumitra Mahajan and Hon’ble Minister of External Affairs Smt. Sushma Swaraj and met a number of other leaders. He also addressed the Viet Nam - India Business Forum and held discussions with several prominent leaders of Indian industry and business. Earlier, he visited Bodh Gaya. 3. The delegation level talks between Viet Nam and India were held in a warm, cordial and friendly atmosphere, reflecting the significant deepening of bilateral relations and enhanced multidimensional engagement since the successful visit of Prime Minister Modi to Viet Nam in 2016 and elevation of the relationship to a Comprehensive Strategic Partnership between the two countries. After the talks, President Tran Dai Quang and Prime Minister Modi witnessed the exchange of agreements on atomic energy, trade, agriculture and fishery, among others. 4. President Tran Dai Quang congratulated and commended India on its achievements in economic and social development, science and technology, and improving its people’s living standards; expressed his support for India’s enhancing role and position in the regional and international arena. President .Kovind and Prime Minister Modi congratulated Viet Nam on its important achievements in socio-economic development and foreign policy; and expressed their confidence that Viet Nam would soon achieve the goal of becoming an industrialised country, with a prominent role and status in the region and the world. 5. Both sides affirmed the long-term and time-tested friendship between the two countries, the foundation of which was laid by the Fathers of the Nations, Mahatma Gandhi and President Ho Chi Minh and nurtured by successive generations of leaders and people of the two countries. Both sides expressed their satisfaction at the excellent state of Comprehensive Strategic Partnership between the two countries, and commended various commemorative activities held in both countries in the Year of Friendship 2017 to celebrate the forty-fifth anniversary of diplomatic relations and tenth anniversary of the Strategic Partnership. President Tran Dai Quang lauded the organising of the “Viet Nam Days in India” on this occasion which concluded successfully the Year of Friendship. 6. Based on the current excellent relations, the Leaders agreed to maintain regular exchange of visits at all levels of the political parties, Governments, legislative institutions and provinces/States and between the people of both countries. They also agreed to hold the next Joint Committee Meeting led by the foreign ministers of the two countries in 2018 in order to review the areas of cooperation and the implementation of the Action Plan of the Comprehensive Strategic Partnership for the period of 2017-2020. 7. Both sides agreed that defence and security cooperation is an important and effective pillar of the Comprehensive Strategic Partnership, and expressed satisfaction at the progress being made in this domain. They welcomed ongoing exchange of senior level delegations, meetings of consultation mechanisms, stronger cooperation between their armed forces and enhanced cooperation in areas of cyber security, combating terrorism and violent extremism in all their forms and manifestations, transnational crimes, human and drug trafficking, maritime security, climate change and food security. 8. The two sides reaffirmed their commitment to an open, free, secure, stable, peaceful and accessible cyber space under the auspices of the United Nations and called for greater cooperation and effective implementation of the agreements signed between the two sides on cyber security. They also agreed to operationalise of the Memorandum of Understanding signed between the National Security Council Secretariat of India and the Ministry of Public Security of Viet Nam and initiate the Deputy Ministerial level dialogue to enhance cooperation in traditional and non-traditional security matters and undertake training and capacity building programmes. 9. The Indian side affirmed its continued willingness to partner with Viet Nam in defence cooperation and in building capabilities and capacities for Viet Nam. Both sides agreed to expedite the implementation of the US$100 million Line of Credit for building of high-speed patrol boats for the Viet Nam Border Guards and urged for early signing of a framework agreement on the US$ 500 million Line of Credit for defence industry. Both sides agreed to further enhance defence ties, including through exchanges of senior level defence delegations, regular senior level dialogues, cooperation between the two armed forces, port calls of naval and Coast Guard ships, capacity building projects, procurement of equipment, transfer of technology and cooperation in regional fora, including ADMM plus. 10. Both sides agreed that it is essential to strengthen cooperation in maritime domain, including anti-piracy, security of sea lanes, exchange of white shipping information, etc. In the spirit of the proposal for an ASEAN-India Strategic Dialogue on Maritime Cooperation made at the Commemorative Summit held in New Delhi in January 2018, the two sides agreed to further promote Vietnam-India bilateral consultation on maritime issues. 11. The two sides unequivocally condemned terrorism in all its forms and manifestations, including cross-border terrorism. The Vietnamese side shared India’s concern that terrorism poses today one of the most serious threats to global peace, security and stability. They underscored that there is no justification whatsoever for act of terrorism and recognised that terrorism cannot be and should not be associated with any religion, nationality, civilization or ethnic groups. They called upon all nations to adopt a comprehensive approach in combating terrorism, which should include countering radicalisation, recruitment, training and movement of terrorists including Foreign Terrorist Fighters, blocking sources of financing terrorism including through organized crimes, money-laundering, smuggling of weapons of mass destruction (WMD), drug trafficking and other criminal activities, dismantling terrorist bases, safe havens and countering misuse of the internet, cyberspace, including social media and other communication techniques by terrorist entities groups and their affiliates. The two sides further agreed that they would cooperate in building a strong consensus for early adoption of the Comprehensive Convention on International Terrorism (CCIT). 12. Both sides agreed that enhancing strong trade and economic engagement is a strategic objective, a core element of the Comprehensive Strategic Partnership and are essential for strengthening bilateral ties. Both leaders expressed satisfaction and commended the significant rise in trade turnover during the last two years. In order to realize potential to both increase the volume of trade and diversify its composition, they requested the relevant ministries and agencies on both sides to explore substantive and practical measures to achieve the trade target of US$15 billion by 2020, including but not limited to utilising established mechanisms, strengthening exchanges of trade delegations, business-to-business contacts, regular organisation of trade fairs and events. Both sides agreed to hold the next Meeting of the Joint Sub-Commission on Trade in Ha Noi in 2018 at the earliest. 13. Both sides urged leaders of business and industry of both countries to explore new trade and investment opportunities in identified priority areas of cooperation: hydrocarbons, power generation, renewable energy, energy, conservation, infrastructure, textiles, footwear, pharmaceuticals, machine tools, agriculture and agro-products, tourism, chemicals, ICT and other service sector industries., The two sides agreed to intensify cooperation to increase productivity, quantum and content of science and technology in agricultural products. 14. Both sides encouraged greater two-way investment between Viet Nam and India. Prime Minister Modi welcomed Vietnamese companies to avail of the favourable investment climate in India under the Make in India programme. President Tran Dai Quang welcomed Indian companies to invest in Viet Nam and affirmed Viet Nam’s commitment to create favourable conditions and facilitation for Indian investments in accordance with Vietnamese laws. He applauded Prime Minister Modi’s efforts which improved India’s ranking in the “ease of doing business”. 15. President Tran Dai Quang highly appreciated India’s long standing and continued grants-in-aid and lines of credit for Viet Nam. He thanked India for increasing scholarships to Vietnamese students, researchers, academic professionals and government officials, especially through the Indian Technical and Economic Cooperation (ITEC) programme, the Mekong - Ganga Cooperation (MGC) framework, as well as the projects under the fund of Quick Impact Projects (QIPs), etc. Prime Minister Modi offered to organise customised courses in areas of interest to Vietnam through the ITEC programme. President Tran Dai Quang appreciated Prime Minister Modi’s announcement at the ASEAN-India Commemorative Summit in January 2018 of undertaking a pilot project on rural connectivity in the CLMV countries which would create Digital Villages and for offering 1,000 fellowships to students and researchers from the ASEAN member states for studying integrated PhD programmes in Indian Institutes of Technology. 16. The two sides agreed that their cooperation in oil and gas exploration, thermal and hydroelectric power and renewable energy and energy conservation is registering remarkable progress. President Tran Dai Quang welcomed Indian businesses to expand their oil and gas exploration and exploitation activities on land and in the continental shelf and Exclusive Economic Zone (EEZ) of Viet Nam and to this effect suggested that relevant Indian companies file concrete proposals for the blocks offered by the Vietnamese side. Both sides agreed to actively pursue the signing of a Memorandum of Understanding on collaboration in oil and gas exploration projects in third countries. The Vietnamese side also welcomed Indian oil and gas companies to avail of opportunities in the midstream and downstream sectors in Viet Nam. 17. President Tran Dai Quang welcomed Indian companies to invest in renewable energy and energy conservation projects in Viet Nam and thanked India for extending support to Vietnam in building a research reactor for the purpose of peaceful uses of atomic energy. 18. The Vietnamese side took note of the request by the Indian side on actively considering signing the Framework Agreement of the International Solar Alliance with a view to strengthening the cooperation in the renewable energy space. 19. Both sides agreed to intensify cooperation in the fields of culture, tourism and people-to-people exchange, widen and deepen cultural and historical ties by cooperating further in the areas of archaeology, conservation and museums to revive and reconnect the civilizational and historic cultural heritage between the two countries. India highly appreciated Viet Nam’s proposal to establish a Viet Nam Cultural Centre in India. 20. Both Leaders appreciated the effective implementation of the project of preserving and renovating the UNESCO World Cultural Heritage Site of My Son, Quang Nam province, Viet Nam. The Vietnamese side welcomed Indian Line of credit for the restoration and preservation of Hoa Lai Tower and Po Klong Garai Cham Tower and grants-in-aid assistance of the Cham community in Ninh Thuan Province, as well as the efforts of the Government of India and the Bhagwan Mahavir Viklang Sahayta Samiti (BMVSS) to provide rehabilitation services and the prosthetic Jaipur Foot to around 500 Vietnamese in the provinces of Phu Tho, Vinh Phuc and other provinces. 21. 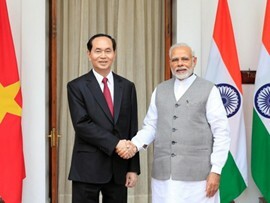 Both sides agreed on the importance of stronger connectivity between Viet Nam and India as well as between ASEAN and India. The Indian side urged Viet Nam to utilise various initiatives of India for CLMV countries, including the US$1 billion line of credit for physical and digital connectivity projects. The progress made in regional connectivity endeavours such as the India-Myanmar-Thailand Trilateral Highway was noted by the two Leaders. The two sides agreed to explore the possibility of extending the India-Myanmar-Thailand Trilateral Highway further to Viet Nam through Cambodia and Lao PDR. 22. The two sides stressed the importance of the early signing of an ASEAN-India Maritime Transport Cooperation Agreement. They sought acceleration of the establishment of direct shipping routes between the sea ports of India and Viet Nam. They also welcomed the commencement of direct flights between New Delhi and Ho Chi Minh City during the visit and urged the airlines of both countries to soon open more direct flights between major cities of the two countries. 23. Prime Minister Modi and President Tran Dai Quang shared convergence of views on various bilateral and international issues, including the regional security situation in Asia. They reiterated the importance of achieving a peaceful and prosperous Indo-Pacific region where sovereignty and international law, freedom of navigation and overflight, sustainable development and a free, fair and open trade and investment system are respected. 24. They emphasised that India and Viet Nam play important roles in safeguarding and strengthening such an open, transparent, inclusive and rules-based regional architecture and in further strengthening of cooperation with ASEAN. They expressed satisfaction at the successful conclusion of ASEAN-India Commemorative Summit held in January 2018, with significant contribution of Viet Nam in its capacity as the Country Coordinator for the 2015-2018 period, and decided to undertake necessary steps to implement the proposals made in the Delhi Declaration to further enhance the ASEAN-India Strategic Partnership. President Tran Dai Quang expressed appreciation of India’s support for ASEAN’s centrality in the evolving regional architecture, its continued contribution to regional peace, security and prosperity and to ASEAN integration and the ASEAN community building process. 25. Underscoring the significance of sub-regional frameworks in strengthening bilateral cooperation and complementing regional cooperation through ASEAN frameworks, they agreed to optimally develop and utilise existing sub-regional frameworks, especially the Mekong-Ganga Economic Corridor. 26. The two sides appreciated their coordination at regional and international fora and agreed to continue this tradition. Both sides reaffirmed their mutual support for each other’s candidatures as non-permanent members of the United Nations Security Council-VietNam for the term 2020-2021, and India for the term 2021-2022. The Vietnamese side reiterated its consistent support for permanent membership of India in a reformed Security Council. 27. The two sides re-affirmed their determination and efforts to further cooperate in maintaining peace, stability and development in the Indo - Pacific region as well as in the world at large. They also reiterated the importance of, and the need for complete compliance with international law, notably the United Nations Convention on the Law of the Sea 1982 (UNCLOS), including the implementation of international legal obligations in good faith, the maintenance of freedom of navigation and over-flight in the South China Sea, full respect for diplomatic and legal processes, peaceful settlement of disputes without resorting to the threat or use of force, and in accordance with international law. In this regard, both sides support the full and effective implementation of the Declaration on the Conduct of the Parties in the South China Sea (DOC) and look forward to an early conclusion of an effective and substantive Code of Conduct in the South China Sea. 28. Both leaders welcomed the adoption of the 2030 Agenda for Sustainable Development and reiterated their commitment to the realisation of the Sustainable Development Goals (SDGs). They agreed that the Global Partnership remains key to the achievement of the SDGs. In this regard, both leaders recalled the Addis Ababa Action Agenda and the importance of fulfillment of the Official Development Assistance committed by the developed countries. 29. President Tran Dai Quang thanked President Kovind and the friendly people of India for their gracious hospitality, and cordially extended an invitation to President Kovind to visit Viet Nam at an early date. President Kovind gladly accepted the invitation and agreed that the timing of the visit would be arranged through diplomatic channels.